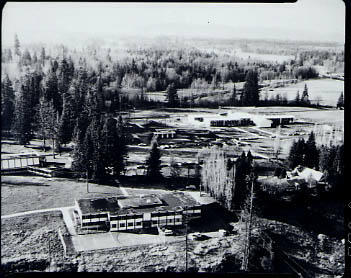 Photograph of an aerial view of the campus grounds, showing the Chapel, the Arts and Science Building, the original dormitories and Douglas Hall after the opening of T.W.C., taken from the west. Note that this image is reversed. See below for information re positive copy, scanned with correct orientation.